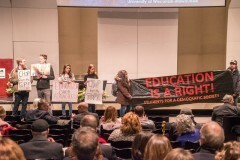 Milwaukee students oppose cuts; seize stage at UW-M chancellors speech | Fight Back! Milwaukee, WI - About 20 students and faculty members rallied at the University of Wisconsin-Milwaukee, Feb. 3, and marched on university Chancellor Mark Mone's Spring Plenary address at the Zelazo Center. Students for a Democratic Society (SDS) led the protest joined by Youth Empowered in the Struggle (YES) as a part of its campaign against the $250 million budget cut to the UW system, now entering its first year anniversary. Resident undergraduate tuition for 2015-2016 is $9452, based on 12 to 18 credits for both semesters. A 3.4% annual increase would effectively result in a total increase of $1351 in tuition per student after four years.